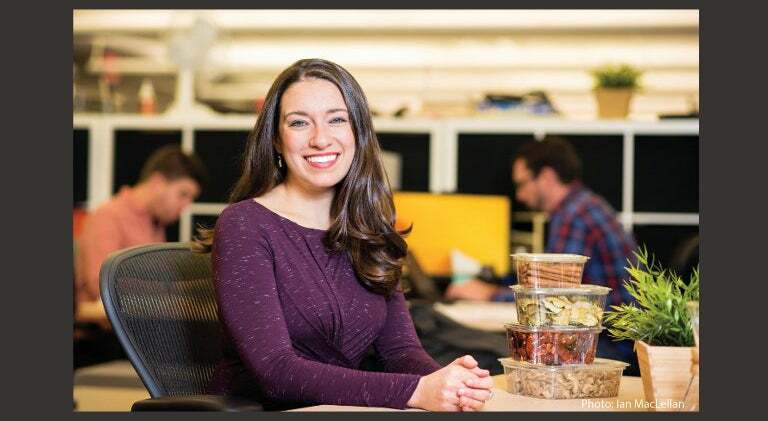 Branchfood founder Lauren Abda, N12, helps entrepreneurs find their way. September 23, 2016- The informal meeting starts with introductions around the room. Among the 20 or so attendees is Darnell Adams, who hopes to eliminate a food desert in Boston’s Dorchester neighborhood by opening a community-owned co-op supermarket. In the corner is Jaime Silverstein, a crop developer for Freight Farms, which builds urban hydroponic farms inside shipping containers. Cullen Schwarz invites everyone to test his app DoneGood, which rates restaurants and other businesses on their social responsibility, including environmental friendliness and worker fairness. The co-founder of Enerchi Bites says she is open to ideas about recyclable packaging for her chia-rich energy bar nuggets. This leads to a discussion about that time Stonyfield Farms tried encasing frozen yogurt balls in edible, fruit-based film skins, to eliminate packaging altogether. A noble idea, but a little weird, most in the room agree. With the right connections, these small companies with big ideas could make a difference in how we eat. These regular meet-ups, where people who work in all areas of food can get together to network and share best practices, are hosted by Lauren Abda, N12, a matchmaker of sorts for Boston food and tech entrepreneurs. Her company, Branchfood, runs these monthly Community Tables, as well as workshops and panel discussions focused on what’s innovative on the local food scene, and leases co-working space to budding food companies from its hip location in a downtown Boston skyscraper.